May 1 is a special day of family fun at CCM! 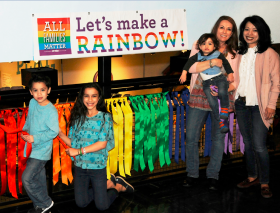 Help transform our central staircase into a 3-story rainbow of ribbons, make a family flag to take home, take a family selfie with rainbow props, and enjoy snacks, music, stories and LGBTQ family-friendly resources in our Hospitality Suite from 10:00-4:30 p.m. Group photo at 1:00 pm! In 2011, Chicago Children’s Museum (CCM) formed an LGBTQ Inclusion initiative as part of our overall diversity plan. We want to ensure all families and children have year-round access to CCM’s three floors of exhibits including Water Ways, Dino Expedition, Tinkering Lab, Kids Town and the Art Studio. Located on Navy Pier since 1995, CCM is now one of the city’s top cultural attractions and the second most visited children’s museum in the country. CCM serves more than 400,000 visitors annually, both on-site and in communities throughout Chicago, particularly in areas with limited access to the museum’s rich array of resources. Navy Pier, 700 Grand Ave.